Volume three of Tale of Oyasama was published on January 26, 2018, by Tenrikyo Doyusha Publishing Company, following the publication of volume one in 2016 and volume two in 2017. The third volume presents an English translation of Part Three of Gekiga Oyasama monogatari, newly revised edition (aidoku shinso ban), published in Japanese in 2008. 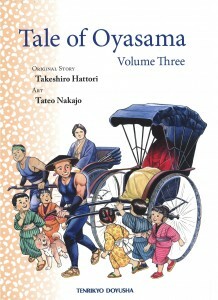 This volume of Tale of Oyasama, which is based on The Life of Oyasama, covers the latter’s chapters 7, 9, and 10. Depicting Oyasama’s parental love that desires to save God the Parent’s children, all human beings throughout the world, this volume culminates in the lunar calendar date of January 26, 1887, when Oyasama opened the portals of the Shrine to withdraw from physical life, shortening Her term of life by 25 years. This manga rendition helps its readers familiarize themselves with the parental love of Oyasama. With this publication, the translation of the Tale of Oyasama series is complete.